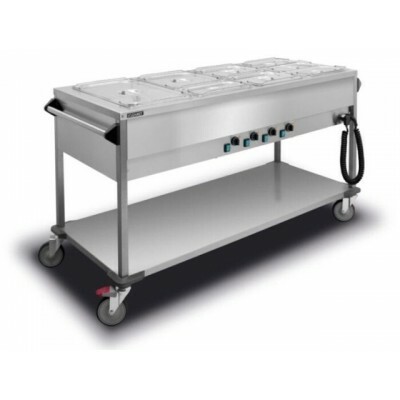 Bain Marie Trolleys There are 17 products. • double water tank• water tanks heated independently• capacity: 2 x 1/1 GN, h=200mm• dimensions: 930 x 690 x 950 mm• power supply: ~240V 50Hz• power rating: 1.4 kW Cupboard not heated. • triple water tank• water tanks heated independently• capacity: 3 x 1/1 GN, h=200mm• dimensions: 1320 x 690 x 950 mm• power supply: ~240V 50Hz• power rating: 2.1 kW Cupboard not heated. • double water tank• water tanks heated independently• capacity: 2 x 1/1 GN, h=200mm• dimensions: 960 x 690 x 1000 mm• power supply: ~240V 50Hz• power rating: 1.4 kW Cupboard not heated. • triple water tank• water tanks heated independently• capacity: 3 x 1/1 GN, h=200mm• dimensions: 1320 x 690 x 1000 mm• power supply: ~240V 50Hz• power rating: 2.1 kW Cupboard not heated.